Part of the appeal of the Batman mythos is that, in becoming his masked alter ego, Bruce Wayne took the pain of great tragedy and used to fuel a transformation. 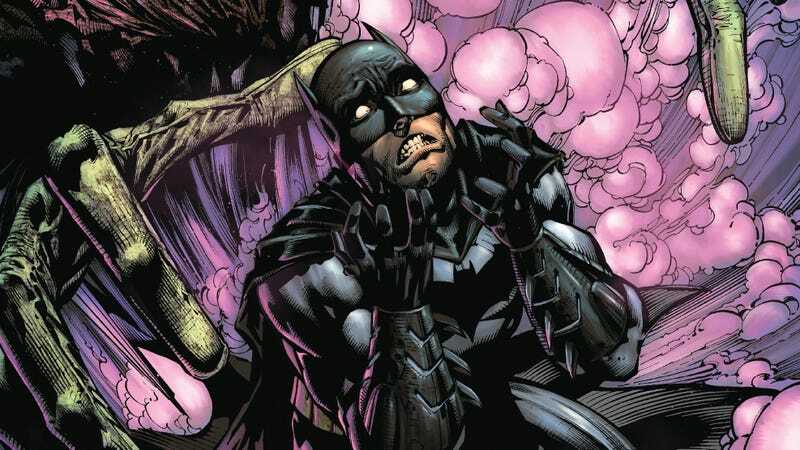 Of course, with pain comes fear, but Batman's one superhero seems to have conquered that emotion. That's why The Scarecrow's one of the best Bat-villains. Even though his modus operandi is almost always the same—fear gas, speeches, blah, blah, blah— twisted psychiatrist Jonathan Crane forces Batman to look inward at all the messed-up stuff that's happened to him but he never talks about. It's what made the Scarecrow sequences in the Arkham Asylum game so memorable. You'll see exactly that in the preview of Batman: The Dark Knight #5. The main appeal of this particular Bat-series in David Finch's detailed and twisted take on DC's superhero house style. Finch's characters bulge with impossible muscles but fade in and out of shadow in ways that create a sinister melodrama. The full issue will be out next Wednesday in comics shops and digital comics storefronts everywhere. Click each page for a larger version.